To review sentence stress and intonation patterns for effective presentations. By the end of the lesson, students will be able to give a sales presentation about their companies’ new product. Read: 5 Great Activities to Use with Your Business English Students! Students have a wide range of vocabulary related to the business field. They are able to articulate full sentences using complex and compound sentences. They are aware of how important intonation is when delivering a message. They are able to differentiate intonation patterns. They will already know many adjectives that are used to describe the product they sell at their company, as they will have used them in their own language while performing sales pitches. They have prior experience in giving presentations in their own language and have given presentations in previous ESL classes. They are familiar with the structure of a presentation: introduction, overview, state points, state results and conclusions, summarize, and close. Students are to give a sales presentation about their companies’ new product at a business conference. They are well established sales people in Japan and this will be their first time presenting their product in an overseas environment. Students may not be able to recall some ‘great speakers’. In this case, the teacher will suggest people such as Martin Luther King Jr., Steve Jobs, etc. They may have difficulty using proper intonation in certain phrases; this will be solved by demonstration and drilling. They may also have problems with some pronunciation in the intonation exercise. The teacher will be around to assist students with their individual needs. Aim: to introduce the topic of giving presentations and to outline skills and characteristics that lead to a good presentation. 1. What are the characteristics of a great speech/presentation? 2. Who are the greatest speakers that you can think of? 3. Who do you need to give presentations to as a part of your job? What are they about? Once students have finished discussing in pairs, have an entire class feedback and have students brainstorm the characteristics of a great speech are. (Examples of ideas that will be elicited: eye contact, clear voice, positive body language, etc.). 20-hour Teaching Business English Course Only $199! Aids/Materials: Vocabulary: Presentation Language worksheet. Students will be given a ‘Vocabulary: Presentation Language’ worksheet that uses words and phrases suitable for presentations. They are to work in pairs in order to fill in the blanks of the passage. After students have completed this activity, the teacher will take it up as a whole class and discuss any vocabulary words they were unsure of. Complete the following presentation excerpts using the words below. Good morning, everybody. I hope you are all doing well today and I’d like to _______ you all for being here. Today I am here to __________ about our latest product, and more _________ about how it works and what it does. I’d also like to __________ the products’ features and __________ inform you about where you can get it and how. ____________, I’d like to briefly __________ our current marketing policy in Canada. ________, I’ll __________ some of the problems we have encountered in our market share. ___________, I’ll ________ our progress this year and continue on with our main _______ for being here; the product. Step 1: Aim: to identify characteristics of effective presentations. Step 2: Preparing for giving a presentation- Identifying words and adjectives that describe products. The teacher will now ask students if they know who Steve Jobs was and what he was responsible for. 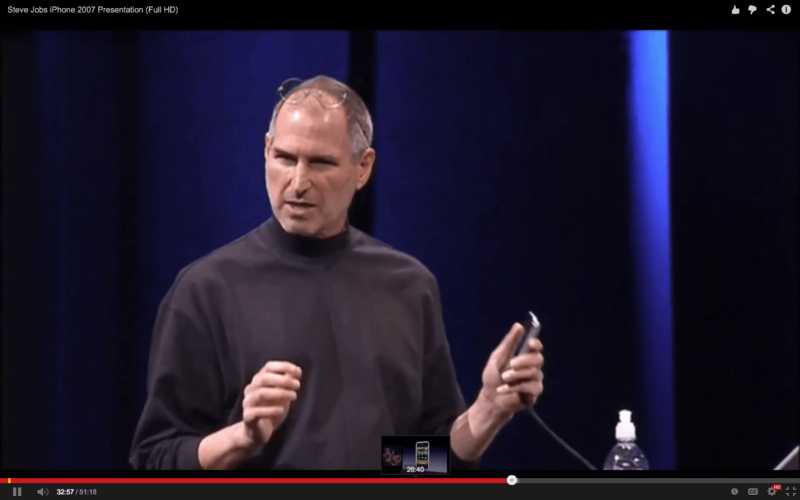 – Can you identify any of the presentation skills described by Doug Jeffries in Steve Jobs’ video? – What makes Steve Jobs’ iphone 2007 launch presentation effective? (Possible answers: visuals, timing of speech accompanied by visuals, clear voice, confidence, knowledge of product). T will ask students to take a closer look at Steve Jobs’ presentation. T will direct them to identify any words they think made his presentation effective; words he repeated, words that they think helped to describe/promote his product. Students should pick out certain adjectives such as revolutionary, life-changing, re-invent, magic, etc. T will write students’ answers on the board and then ask them to think of other vocabulary words they could use to sell a product, focusing on a product that the company they work for sells. “If you were to sell your company’s new product in a presentation like Steve Jobs’, what type of words would you use to engage the audience and make them want to buy your product? Come up with as many adjectives as you can to promote your product.” Students will compile an individual list. Once they have finished their lists, they will discuss their adjectives together as a class. T will write their ideas on the board, adding to the list that we compiled from Steve Jobs’ presentation and give the students time to copy any of the adjectives that they wish to use for their presentations into their notes. Aim: Students will create a presentation with the assistance of ICT tools (PowerPoint/Camtasia) to sell a product to their classmates using appropriate vocabulary and body language. For the final stage of the lesson, T will tell students that they are going to create a presentation, much like the one they viewed in the Steve Jobs video, using ICT tools (Camtasia or Powerpoint) to sell a product of their choice. The product must be something they are fully aware of as they will not have much time to research. T will briefly go over the main stages of a presentation. Students’ presentation must follow this format: introduction, overview, state point, state results, summarize, and close. After each student presents, the rest of the class will give them feedback regarding their presentation (both good and bad) and what they need to work on for a real life sales presentation scenario. Adapted from lesson plan by 120-hour TEFL certificate graduate. Take a TESOL course with Teaching Business English specialist!